↑ Including all the overseas departments. ↑ Metropolitan France only. 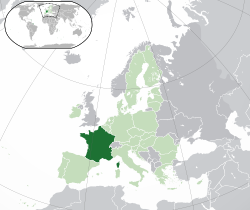 The population density for the whole territory of the French Republic (including all overseas départements) is 103.49099/km2 (268.04043/sq mi). ↑ CET applies to Metropolitan France only. Time zones across the French Republic span from UTC-10 (French Polynesia) to UTC+12 (Wallis and Futuna). ↑ "Résultats de la recherche - Insee". ↑ "The World Factbook – Field Listing – Area". CIA.gov. Central Intelligence Agency. पहुँचतिथी 1 November 2015. ↑ 4.0 4.1 "Montly estimate INSEE- Insee". ↑ "France, World Economic Outlook Database, April 2016". International Monetary Fund. पहुँचतिथी 9 मई 2016. ↑ "CIA World Factbook". CIA. पहुँचतिथी 16 April 2013. ↑ "History of France". Discoverfrance.net. ओरिजनल से 24 August 2011 के पुरालेखित. पहुँचतिथी 17 July 2011. ↑ उदाहरण: "frank". American Heritage Dictionary. "frank". Webster's Third New International Dictionary. And so on. ↑ Michel Rouche (1987). "The Early Middle Ages in the West". में Paul Veyne. A History of Private Life: From Pagan Rome to Byzantium. Belknap Press. प. 425. ISBN 0-674-39974-9. OCLC 59830199. ↑ Tarassuk, Leonid; Blair, Claude (1982). The Complete Encyclopedia of Arms and Weapons: the most comprehensive reference work ever published on arms and armor from prehistoric times to the present with over 1,250 illustrations. Simon & Schuster. प. 186. ISBN 0-671-42257-X. पहुँचतिथी 5 July 2011. ↑ "Mont Blanc shrinks by 45 सेमी (1.48 फीट) in two years". Sydney Morning Herald. 6 November 2009. पहुँचतिथी 9 August 2010.